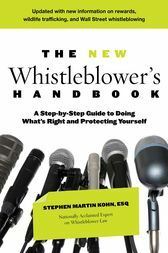 Stephen Martin Kohn is one of the leading whistleblower attorneys in the United States and is the Executive Director of the National Whistleblower Center. Since 1984 he has successfully represented numerous nationally recognized whistleblowers. He is regularly consulted by House and Senate leaders for help in drafting whistleblower protection laws. He is the author of several legal books on the subject.